Goal setting is one of the most powerful tools that most people use to achieve what they want in life. 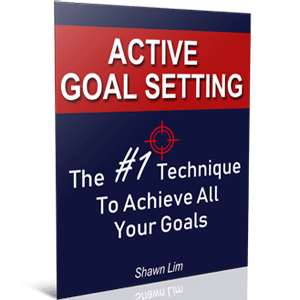 The problem is that many of them fail to achieve their goals and one of the reasons for this is that they don’t know how to set exciting goals that can drive them every day. Setting goals and getting driven by your goals and then take massive action to achieve them are two different things. You can have many goals. But if your goals are not exciting and they do not motivate you to take action, your goals are as good as no goals. This is why it is important to set goals that truly drive you and motivate you. You want to set a goal that is so exciting that you can’t wait to act on it. You want to be able to jump out of your bed each morning and can’t help thinking about hitting that goal. When you set this kind of exciting goals, rest assure, achieving them is just a matter of time. When people fail to achieve their goals, it because they fail to stick to their goals. They take action and act according to their plans only for the first few days or weeks. And after that, they lose interest and their motivation fades. Eventually, they ditch their goals, give up, and choose to do something else instead. Never let this happen to you. If you find it hard to stick to your goals and you often don’t have the drive to work on your goals, you need to rethink your goals. You want to set goals that can drive and motivate you over the long-term. Not just a few short days. Here are the 7 factors that you must consider when setting your goals. Goal setting is easy, but setting a goal that you really can be challenging. Most people get it wrong by setting a goal that they don’t really want. Let me give you an example. When you see your friend drives a new luxury car, you decided that you want to drive a car like that too. And so you set it as your goal to buy the car. The thing that is owning and driving that car is not what you really want. Yes, it is fun to drive the car, but if it is not what you truly want, your motivation will never last. Another example is that when people see their friends travelling overseas and visiting another country for vacation, they want to do the same. They then set it as a goal to visit those places. However, the goal will not work out because it is not what they really want. Thus, ask yourself, deep down, what do you really want to achieve in your life? Do not be influenced by others and then set your goals according to their opinions. This is your life and you can always choose how you want your life to become. If you are unsure what how to set a goal that you really want, consider setting a goal that allows you to experience life. Some people call it “experience goal”, or “end goal”. For instance, making a million dollars or wanting a truck is not an end goal. These are destination goals. An end goal allows you to experience life. It focuses on the journey, not the destination. When you say that you want to make a million dollars, that is the mean goal. It is a goal that focuses on the destination, not the journey. An end goal, on the other hand, allows you to experience the journey. It can be something you want to experience and feel. For example, an end goal can be something like you want to enjoy freedom. The freedom of making choices, the freedom that you don’t have to worry about paying the bills, and the freedom that you don’t have to think about money and you can just travel anywhere at any time you want. An end goal may not be able to quantify using the SMART goal system, but it is something crucial to consider. Driving a luxury car and living in a big house may be what you think you want, but in the end, what you truly after is the feeling and the sense of pride that you have “done it”. I strongly suggest you read this article by Steve Pavlina about end goals vs means goals. The article gives you a better idea of both goals and how you can approach them with clarity. So set an end goal that gives you the experience, not the result. Sometimes, your goals are not exciting enough because they are not big enough. Therefore, you can consider double, triple, or 10x your goals. For instance, if you are currently earning $5,000 a month, setting a goal to earn an additional $500 may not sound exciting to you. Hence, you can choose to triple or 10x the goal. How about earning $10,000 a month? Or if you are already making a million dollars last year, try to challenge yourself by doubling the amount. Setting big and bold goals are exciting because they can be life-changing. Think about it, do you think that earning an additional $100 will be more life-changing or earning an additional $100,000? You know the answer. When you see yourself completely change your life and are living your ideal lifestyle, the visualization excites you. Your thoughts drive and motivate you the moment you think about living the life you want. This is why setting big goals can drive you. So are the goals you set big enough? Can they drive and motivate you so that each morning you will want to jump out of your bed and to work on them? There is no point to set a goal that you don’t believe you can achieve. Although you are suggested to double, triple or 10x your goals, make sure you sincerely believe that you can achieve them. If you are earning $2,000 a month and you set your goal to earn $100,000 in the next month, highly likely, you are going to fail. The reason is simple, you may consciously think that the goal is exciting and big enough to drive you, but it may not always be the case. This is because subconsciously, you may not truly believe that earning $100,000 the next month is possible. And when you don’t believe that something is possible, you will never do it or take action. Even if you do take action and work on the goal, you will only put in a half-hearted effort. Think about it, if you don’t believe that you are going win the lottery tonight, will you make the effort to buy a ticket? If you don’t believe that you are lucky enough or that you stand a chance to win the lottery, you won’t bother whether you buy the ticket or not. People gamble because they think that they can win. If they TRULY BELIEVE (100%) that they are going to LOSE, they will never gamble in the first place. This is why your beliefs on your goals are important. When you believe that you can achieve your goals with 100% certainty, you will do whatever it takes because you know you can’t fail. On the other hand, if you have doubts, you will never really do it with 100% certainty. You may hold back and your holding back is what causes you to fail. Therefore, set a goal that you really believe in. Having a tracking system is important to your goals’ success. Without tracking and know where you are, how can you know how much you have done and how far away you are from your goals? You see, my friend, another interesting reason people fail to achieve their goals is that they have no idea where or how far they are from their goals. They set the goal, but they don’t measure it. As a result, they are lost. And when they do not know their progress, they lose interest. And when they lose interest, they started to have doubts and eventually, they will give up. When you measure and track your goals, you know where you stand. More importantly, you are creating a place in your subconscious mind and telling it that your goals are important. Imagine that you can’t take your mind off your goals. You constantly think about them, how much you have done, and how far you are from them. Even when your friends ask you out for a drink, you will reject them because you know that you are just one step behind your goals. In short, measuring and tracking your goals allow you to focus better on them. It helps eliminate distractions and put you in the right frame of mind to take action. Thus, create a tracking and measuring system for your goals. This article from ToughNickel really nails it. I strongly recommend you read the article. In the article, the author, Melanie Palen shared a couple of fun ways how you can track your goals. Keeping score of your goals is the most ignored factor. A lot of people set goals, but they don’t measure and track them, which is why they fail to achieve them in the first place. If you want to learn more about setting and achieving your goals, read this great book, The 4 Disciplines of Execution. How often do you recalibrate and review your goals? And the answer from most people? Never. If you have never recalibrated or review your goal, how can you tell if what you do is going to take you to your goal, right? Imagine you are firing an arrow. First, you aim it, and then you shoot it. If the arrow landed a little lower to the target, what do you do next? You aim higher. This is why reviewing your goal is important. It gives you feedback and tells you what you need to do to hit your goal. Sadly, most people don’t review their goals. After they set the goal, take action, and if they don’t get the result they want, they throw in the towel and quit. They then set another new goal. And the same thing happens again. If you want to achieve your goals, you must take time to recalibrate and review. Reflect on the results you are getting. Are you producing and moving toward your goals? Or are you moving backwards? When you review your goals and results, you don’t just understand better how your actions affect your goals, you also condition your mind to think about your goals, most of the time. Before you take an action, you will think, “Will this action affect my goal”, or “Can this action move me toward or backward from what I want”. This kind of thought pattern is exactly what you want to make your goals exciting. When your goals are what you truly desire to achieve, constantly reviewing them makes the whole process fun. Finally, in order to transform your goals from something boring to something exciting, you must fully immerse yourself into your goals. You can’t learn how to swim by reading a book. You can’t learn how to ride a bike by watching a video too. Yes, reading, watching, and listening do help, but in order to achieve your goals and make your goals exciting, you must EXPERIENCE them. You must immerse yourself into the goals. Don’t just read about how playing tennis is fun, do it and play the game. And if you want to build a successful blog, don’t just read about it, do it. Experience it. Immerse yourself in the game to feel the game. That’s how you can make your goals most exciting. When you watch someone riding a roller-coaster, you feel the excitement and at the same time, you may feel scared. But the level of excitement is the highest when you step up and take the ride yourself. The same goes for goal setting. When you set a goal, you feel excited, but the excitement is the highest when you make progress, feel the fulfilment and the sense of satisfaction you get from making progress. I’m feeling good every time when I think about building a successful blog. However, the real excitement comes after I have completed every blog post. I feel satisfied and extremely fulfilled that I have made another progress. I know that as long as I keep doing it, I’m making my goals alive. I know that in order to feel the most excitement from my goals, I must act and experience them. Therefore, don’t just set your goals. Act on them. Work on them. Experience them. This is how you can raise the level of excitement to the next level. Setting goals can be easy, but setting exciting goals that drive and motivate you to work on them each day can be challenging. Do you think this article is helpful and inspire you to set better goals? Share your thought with me in the comment section below. Tell me what you think. Cheers.